A former police officer from Worthing has been jailed for perverting the course of justice, Sussex Police have said. 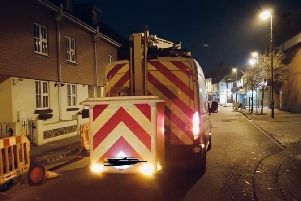 A police spokesman said Simon Wright, 59, of Findon Road in Worthing, admitted perverting the course of justice while trying to avoid punishment for driving a police car through red lights with his blue lights active, with no lawful reason to do so. Police said the court heard that, on June 25 and 26, 2018, the then police constable drove a marked police car through red traffic lights in Worthing with blue lights activated as if responding to an emergency call, when that was not the case. When challenged by supervisors, police said, he lied in an attempt to avoid prosecution and disciplinary measures. The police spokesman said that at Lewes Crown Court yesterday (February 5), after pleading guilty to perverting the course of justice, Wright was sentenced to four months' imprisonment. Wright left Sussex Police on November 16 under investigation for gross misconduct for three counts of honesty and integrity and one of discreditable conduct, said police. Despite leaving the force, he was still subject to a special case (fast track) gross misconduct hearing at Sussex Police HQ on November 28, which he did not attend. Chief Constable Giles York, who chaired the hearing, concluded that had he still been serving, he would have been dismissed from the force. Detective Superintendent Steve Boniface, head of Sussex Police's professional standards department, said: "Police officers must behave in a manner that does not discredit the police service or undermine public confidence, whether on or off duty. "Simon Wright's criminal disregard for the law is clearly completely out of keeping with the role that others uphold with pride, integrity and with the trust of the public whom they serve. "It is important to show that the force will fairly investigate its own staff and this highlights our determination not to allow the name of Sussex Police to be tainted, nor bring into disrepute the enormous amount of good work carried out day-to-day by thousands of hard-working and enormously dedicated police officers and staff."